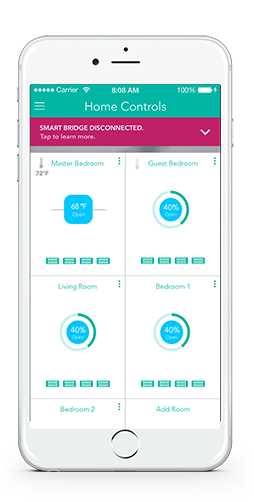 Your Smart Bridge is unplugged from its power source. Your Smart Bridge is disconnected from your modem or router, or your internet's out. There is another error that caused your Smart Bridge to lose its connection, including a potential server issue on our end. If your Smart Bridge is plugged into power and connected to the internet but you still see the error message, unplug *both* cords, wait two minutes, and then plug in the ethernet cord followed by the power cord. Once your Smart Bridge is powered back on, check that all three of its LEDs are lit up. There should be a green and amber light in the back where the cords plug in, and a blinking green light on top of the bridge above the Keen logo. If you are setting up your system for the first time, or you recently switched ISPs, routers, modems, etc, you may have inadvertently blocked your bridge from connecting to our server. First, try connecting your ethernet cord into a different port on your router, or directly into your modem if there's an open port. If you need the bridge's MAC address, please write to our team via the link below. If you see all three lights, you've tried the above steps, and you still have the Smart Bridge Disconnected error, please contact support.